Kaplan, A. (1964). The conduct of inquiry: Methodology for behavioral science. San Francisco: Chandler Pub. Co.
What is science? Is it biology? Is it psychology or anthropology? Is it educational research? The author states that science is all of those. He maintains that how scientists in those fields may look at life from the lense of that science, but it is still science. Different scientists view objects in a manner conducive to their particular field of science. He goes on to suggest that some of the most exciting discoveries are made when scientists from different fields work together. Kaplan goes on to explain the use of logic in science. According to Kaplan, logic deals with what scientists do as well as how they are doing as scientists. Logic-in-use is simply that, using logic. Reconstructed logic is the explicit formulation of logic. Bear in mind, these terms are not the same. Logic-in-use has to prove itself through the process of inquiry. Reconstructed logic occurs in the inquiry process. A scientist uses observation, educated guesses, and scientific intuition to come to a set of hypotheses regarding his or her inquiry. From these hypotheses he or she deduces observable consequences which he or she tests through experimentation. This experimentation allows him or her to confirm or disconfirm the hypotheses. This is reconstruction of logic. Simply put reconstructed logic is a hypothesis. This hypothesis is put to use over time making it logic-in-use until this logic is no longer feasible. According to Kaplan, there is no logic-in-use in making discoveries. Logic-in-use is found in the justification context. The logic of discovery is like the strategy used when playing a game. We can look at the game of chess as an example. This strategy is not the rules of how to play the game, rather is it the strategy that is known to a good chess player. It is the intuition used by a good chess player. 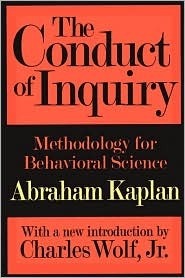 When Kaplan uses the term methodology he describes the study along with the description, the explanation, and the justification of methods and not just the methods themselves. Techniques are the specific procedures used in any given science, or in an inquiry. The techniques in science are a ways of doing that science. Many use the term methodology when they are really speaking of techniques. There are times when the term methodology is used when describing the scientific method. Philosophers use the terms methodology and epistemology, philosophy of science, interchangeably. In this case, we are looking at the basic questions regarding the pursuit of truth. Kaplan goes on to state that methods are the set of techniques used in all sciences. Methods include such procedures as forming concepts and hypotheses, making observations and measurements, performing experiments, building models and theories, providing explanations, and making predictions. The purpose of methodology is to describe and analyze methods, to make generalizations regarding the success of the techniques used to suggest new techniques or approaches. Methodology is to help us understand not only the products of scientific inquiry, but the process as well. Kaplan does not define the scientific method as used in behavioral science. Rather he uses the metaphor of baseball to describe it. In baseball, there are ways to hit, pitch, run bases, field the ball, manage the players, and there are strategies for using pinch hitters, relief pitchers, signaling runners, and maintaining team spirit. These are all needed to play the game well. However, many historians and scientists state that there is no such thing as the scientific method. Kaplan asserts that training in behavioral sciences allows us to appreciate the techniques used. He further asserts that we all have our own viewpoints, from the clinician to the psychologists to the field worker. Our viewpoints are not wrong. What is wrong is only what our viewpoints deny not what they affirm. There is an unlimited amount of techniques one can employ. Kaplan relates this to the fable of an object from outer space coming to earth. The physicians try to uncover its composition, structure, and function to no avail. A psychologist approaches the object and asks, “What’s our name?” To which the object replies, “Ralph.” The idea that behavior implies speech allows the behavioral scientist techniques not used by other scientists. Each science finds some techniques more appropriate than others. A microscope has very limited use in astronomy while a biologist cannot learn much about ET with a telescope. What is distinctive about behavioral science is its subject-matter. It is important that behavioral scientists distinguish between the meaning of the act to the person, or other people, and its meaning to us as scientists. Kaplan calls this act meaning and action meaning, respectively. A behavioral scientist seeks to understand behavior in the same sense that a physicist seeds to understand nuclear processes. The behavioral scientist seeks to understand two things: why a person does a certain thing and why he says the things he says. 1–How is logic-in-use applied to educational research? 2–How is logic-in-use applied to the field of education? 3–How do educators reconstruct logic?